Scientists grew excited last week as Russia's planned its first interplanetary mission in 15 years. By now, the ambitious mission should be powering through space, toward the Martian moon Phobos. Instead, Russia's space agency spent Friday discussing uncontrolled reentry scenarios. As if that news weren't bad enough, this could be an uncontrolled toxic reentry scenario. Phobos-Grunt -- correctly written "Fobos-Grunt," meaning "Phobos-Soil" or "Phobos-Ground" -- is fully laden with unsymmetrical dimethylhydrazine and nitrogen tetroxide; that's ten tons of fuel and oxidizer. The probe itself weighs in at only three tons. The majority of the fuel will likely vaporize during reentry, but everyone will be hoping for a splash-down in an ocean (which covers two-thirds of Earth, fortunately), as the wreckage will still be hazardous. There's also a small quantity of radioactive cobalt-57 in one of the science missions housed in the probe -- a fact that will most likely cause a media frenzy. It is for these reasons that the Russian media is dubbing Phobos-Grunt "the most toxic falling satellite ever." Though Russian mission controllers are frantically trying to regain control of the craft, it's not looking good. Friday's efforts are widely regarded as a last-ditch attempt to salvage the mission. Other space agencies such as NASA and ESA have offered to assist, but the probe is quickly becoming unrecoverable. It is unknown whether there's a software error or hardware glitch, but attempts to upload new commands to the onboard computers have so far failed to change the situation. Phobos-Grunt's batteries are draining and its orbit is degrading. It looks as if the probe will reenter later this month/early December. annaD is reportedly putting a Nov. 26 reentry date on Phobos-Grunt. Like UARS and ROSAT, the likely Phobos-Grunt reentry will be uncontrolled and at the mercy of a highly dynamic upper atmosphere. Also, the probe's orbit takes it between the latitudes 51.4 degrees North to 51.4 degrees South -- most of the world's population lives within that zone, and Phobos-Grunt could come down anywhere. Despite the fact that pieces of the probe will hit the ground, it is still extremely unlikely it will cause death and destruction, however. The demise of Phobos-Grunt will be a huge loss to the scientific community. Not only was the mission designed to land and scoop up some regolith (dust and rock) from Phobos' surface, returning it to Earth for analysis, it is also carrying a fascinating Planetary Society experiment called the Living Interplanetary Flight Experiment, or "LIFE." LIFE is composed of many different types of bacteria to small organisms that seem to tolerate the space environment pretty well. Hmm...I don't know if I want to catch that one with my catchers mit. Maybe an umbrella and a gas mask would be better. MONTREAL — Canadian science will play a key role in the hunt for signs of life on Mars as part of a NASA mission launching next weekend. Slated to blast off Saturday, the Mars Science Laboratory rover will focus on what one Canadian physicist describes as the red planet's Holy Grail. The University of Guelph's Ralf Gellert is lead scientist on the Alpha Particle X-Ray Spectrometer (APSX), which is Canada's contribution to the NASA "Curiosity" rover. The job of APSX's sensor, which is the size of a soupcan and works off the end of the rover's robotic arm, is to analyze chemical elements in Martian rocks and soil once it lands in August 2012. Gellert says the mission will focus on clay spotted on the surface by Mars Express, an orbiting satellite launched by the European Space Agency in 2003. "Clay is something like the Holy Grail of Mars exploration," he said in a recent interview. Alain Berinstain, the Canadian Space Agency's director of science development, explains that clay is a basic mineral which exists on Mars and on Earth. "And everywhere you find clay, you might not find water there today, but at least there has been some in the past. And remember: wherever there's water on Earth there's life," he said in an interview. "So if you follow the water on Mars, then definitely you're going to come closer to finding habitable zones or one day actually finding evidence of life itself." Berenstain says APSX is one of 10 instruments on Curiosity, a motorized field geologist and geochemist. APSX was funded by the CSA and MacDonald, Dettwiler and Associates (MDA) was the prime subcontractor. Gellert says there's a very good possibility that the analysis carried out by the roving science lab will provide a better idea whether there was life on Mars. This is another thread that is too big to fit on my screen. This color view of a mineral vein called "Homestake" comes from the paannamic camera on NASA's Mars Exploration Rover Opportunity. SAN FRANCISCO – A well-traveled NASA Mars rover has found some of the best evidence yet that water flowed on the Red Planet's surface long ago, researchers announced Wed., Dec. 7. The new discovery at Endeavour Crater is particularly convincing and compelling, researchers said. Thanks, Swampy. That's another piece of evidence that supports the idea that life could have existed up there. I think they more they look the more they will find that Mars isn't all that different from the Earth. It may be a little smaller and a little further from the sun but the conditions there were once capable of supporting life just the same as they are here now. I still think there is life there even now...it's just a matter of time before they prove it. This is cool ! While going through images last night I came across this also. 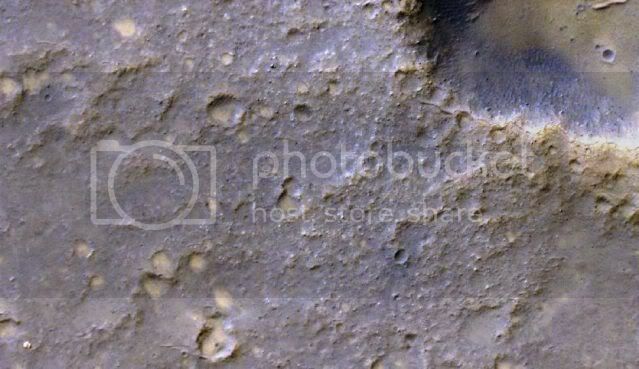 They have a microscopic image of this same band of rocks as well which shows pretty good detail. The next rover on its way there will most likely make important discoveries also, I cant wait to see the images . Me tooooo! I get the most excited about the stuff that can't be refuted or debunked ....it comes with pics taken by a satellite! 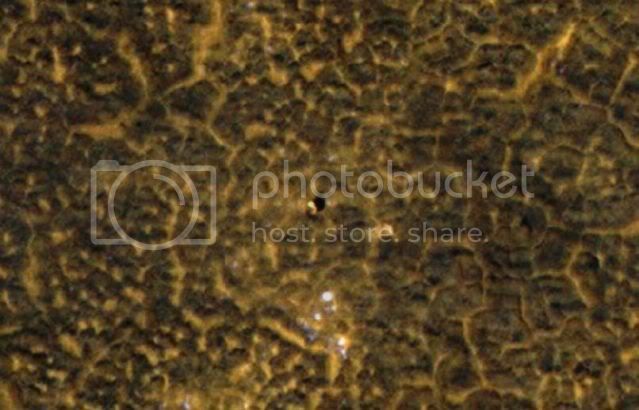 I finally found the photos I was looking for that showed the clouds on Mars. It took me a while to relocate them. Most people may not realize that Mars even has an atmosphere that can produce cloud formations, but it does. The atmosphere is much thinner than the Earth's, and is made up mostly of carbon dioxide and nitrogen, with a few other trace gasses mixed in. 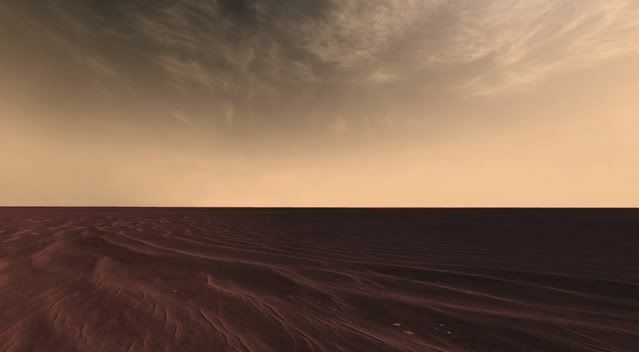 In addition to clouds there are also huge dust storms that bellow up every now and then thanks to the rapid heating and cooling of the martian surface. This dramatic change in temperature is also due to the thin atmosphere and would make it very difficult for large organisms to survive there...if there is any life there at all. I personally think there is somewhere. Maybe not a lot of it but something up there is bound to be alive. Great photos. If the mineral in the picture is gypsum it does indicate that it was crystallized out in a brine of minerals situation (like under the mud of a very mineralized lake or salt flat). However it being on the surface indicates not much water action because it dissolves in the rain or if covered by water. Most of the water that was there evaporated away a long time ago. The little that is left is either in aquifers underneath the ground or frozen into ice at the poles. They say that the clouds are made up of ice crystals rather than water vapor. FOR RENT OR SALE: Large property, offering huge paannamic vistas, idyllic average temperature of 81 degrees Fahrenheit below zero. Habitable and available immediately. Full Disclosure: It's actually underground -- and it's on Mars. While few things could seem more remote, some scientists now believe that the earliest traces of life on Earth originated on Mars -- and parts of that planet are actually more hospitable to life than we previously thought. Researchers from the Australian National University have determined that very large regions under the surface of the red planet may contain water and have sufficiently comfortable temperatures for Earth-based life -- albeit microbial life. "We found that 3 percent of the volume of Mars is habitable in terms of having the right temperatures and pressures for liquid water and life," astrobiologist Charley Lineweaver told The Huffington Post by email. "The biggest surprise is that extensive regions of Mars could be habitable in terms of temperature, pressure and water." Lineweaver is the leader of an ANU team that compared models of the similarities of pressure and temperature conditions between Earth and its nearest planetary neighbor, as pictured below. "One can get a nice overview of where H20 is liquid, ice and vapor from a pressure-temperature phase diagram," he wrote. "That let us identify and distinguish between inhabited and uninhabited water on Earth, and we were surprised to find a lot of it on Earth." If there is a thread elsewhere feel free to move it. I moved your post about the Mars water over here Paulette. Come ultimate Disclosure NASA will have to admit the Face on Mars was not a trick of light and shadow. They will be forced to reveal they have been lying to the American people since 1969. Prediction for the new year..no one will ever admit they withheld anything from the public. I read a report not too long ago that said they had seen it snowing on Mars. It even showed a picture and Im almost certain it was a NASA site. I'll have to try to find it again. If anyone happens to come across it, please post. Thanks ! Unfortunately, I agree with that, Jo. Even if it were conclusively proven that ETs exist and that the government knew about it they wouldn't admit that they lied. They would just pretend that the past 60 plus years of lying and deception never happened, or that it was for the good of the country or national security or some such nonsense. Could Mars and Moon Harbor Alien Artifacts? Leading Astrophysicists Says "Yes"
The Search for Extraterrestrial Intelligence (SETI) has a low probability of success, but it would have a high impact if successful. Physicists Paul Davies and Robert Wagner of Arizona State University argue that it makes sense to widen the search to scour the Moon for possible alien artifacts. Meanwhile at Penn State, researchers propose the same search for Mars. To date, SETI has been dominated by the paradigm of seeking deliberately beamed radio messages. The ASU team argues that Alien civilizations may have sent probes to our region of the galaxy, and that any mission to the solar system would probably have occurred a very long time ago. The lunar environment could preserve artifacts for millions of years due to the absence of erosion and plate tectonics. Davies and Wagner reason that the rapidly-expanding database of the photographic mapping of the Moon's surface by the Lunar Reconnaissance Orbiter (LRO) to 0.5 m resolution offers an ideal opportunity to search for ancient artifacts and has mapped a quarter of the moon's surface since mid-2009. Among the LRO images, scientists have spotted the Apollo landing sites as well as all of the Nasa and Soviet unmanned probes, some of which were revealed only by their odd-looking shadows. The seismometer on Nasa's Apollo 12 mission detected only one impact per month from roughly grapefruit-sized meteorites within a 350km radius. According to Davies and Wagner, it could take hundreds of millions of years for an object tens of metres across to be buried by lunar soil and dust kicked up by these impacts. Software can search for strange-looking features, such as the sharp lines of solar panels, or the dust-covered contours of quarries or domed buildings. These might be visible millions of years after they were built..
As Stephen Hawking’s 70th birthday approaches, the scientist who was told he wouldn’t live past 40 answered some of the public’s questions focusing on humanity's destiny to inhabit outer space. A bit of a futurist, Hawking's latest book, George's Secret Key To The Universe is an explanation of the world aimed at children, a lesson for the next generation. "Many people have asked me why I am taking this flight. I am doing it for many reasons. "First of all, I believe that life on Earth is at an ever-increasing risk of being wiped out by a disaster such as sudden nuclear war, a genetically engineered virus, or other dangers. This anxiety was picked up again in Hawking’s answer on the Today programme. He was asked "Do you think the human race will survive all potential disasters and eventually colonise the stars?" "It is possible that the human race could become extinct, but it is not inevitable. "I think it is almost certain that a disaster such as nuclear war or global warming will befall the Earth within a thousand years." "It is essential that we colonise space. I believe that we will eventually establish self-sustaining colonies on Mars, and other bodies in the solar system, although probably not within the next 100 years." This crazy toxic-chemical-carrying Russian thing is now expected to fall down to Earth around January 15th. meteorite chunks from the red planet that fell in Morocco last July. This is only the fifth time scientists have confirmed chemically Martian meteorites that people witnessed as they fell. The fireball was spotted in the sky six months ago, but the rocks were not discovered on the ground in North Africa until the end of December. This is an important and unique opportunity for scientists trying to learn about Mars' potential for life. So far, no NASA or Russian spacecraft has returned bits of Mars, so the only Martian samples scientists can examine are those that come here in meteorite showers. Scientists and collectors of meteorites are ecstatic, and already the rocks are fetching big money because they are among the rarest things on Earth, rarer even than gold. A special committee of meteorite experts, including some NASA scientists, confirmed the test results Tuesday. They certified that 15 pounds (7 kilograms) of meteorite recently collected came from Mars. The biggest rock weighs more than 2 pounds (1 kilogram). Astronomers think millions of years ago something big smashed into Mars and sent rocks hurtling through the solar system. After a long journey through space, one of those rocks plunged through Earth's atmosphere, splitting into smaller pieces. Most other Martian meteorite samples sat around on Earth for millions of years, or at the very least for decades, before they were discovered, which makes them tainted with Earth materials and life. These new rocks, while still probably contaminated because they have been on Earth for months, are purer. One of the crucial decisions the scientists made Tuesday was to connect these rocks officially to the fiery plunge witnessed by people and captured on video last summer. 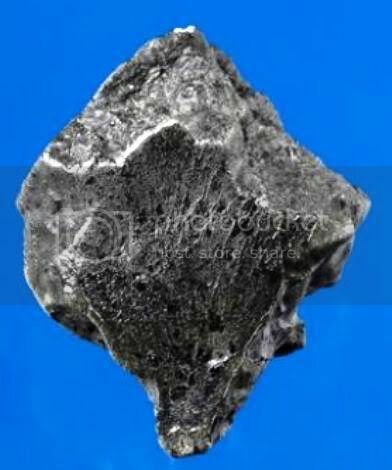 The announcement and the naming of these meteorites -- called Tissint -- came from the International Society for Meteoritics and Planetary Science, which is the official group of 950 scientists that confirms and names meteorites. Meteorite dealer Darryl Pitt, who sold a chunk to Herd, said he charges $11,000 to $22,500 an ounce and has sold most of his supply already. 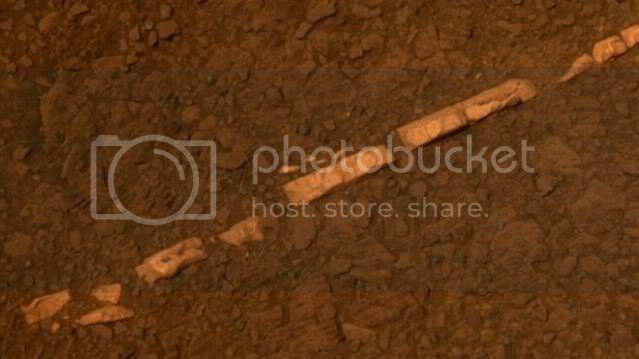 At that price, the new Martian rock costs about 10 times more than gold. "It's scientifically invaluable," Herd said. "These are really beautiful specimens. It's a rare type, so fresh and aesthetically pleasing." Several of the world's top experts in meteorites, including those who work for NASA, told The Associated Press that they were sure this was a piece of Mars. Tony Irving of the University of Washington is the scientist who did the scientific analysis on the rocks and said there is no doubt that they are from the red planet. Scientists can tell when meteorites are from Mars because they know what the Martian atmosphere is made of, thanks to numerous probes sent there. The chemical signature of the rocks and the Martian air match, Irving said. Another clue is that because planets like Mars are more geologically active, its rocks tend to be much younger -- millions of years old instead of hundreds of millions or more -- than those from the moon or asteroids. "It's incredibly fresh. It's highly valuable for that reason," said Carl Agee, director of the Institute of Meteoritics and curator at the University of New Mexico. "For someone who knows their Martian, this is a beauty. It's gorgeous." How can Mars rocks only be millions of years old instead of hundreds of millions like on Earth? If they were formed that recently wouldn't there have to be volcanic activity on Mars to form them? Are there any active volcanoes up there? I didn't think there was any. This image in the center of the photo, taken Jan. 26, 2012, shows NASA's no-longer-active Phoenix Mars Lander spacecraft after its second Martian arctic winter. The lander has the same appearance as it did after its first winter, as seen in an image from May 2010. This view is from monitoring frost patterns at the Phoenix landing site in far-northern Mars, using the High Resolution Imaging Science Experiment (HiRISE) camera on NASA's Mars Reconnaissance Orbiter. Spirit drove off the lander platform in January 2004 and spent most of its six-year working life in a range of hills roughly two miles (3.2 kilometers) to the east, NASA officials said in a statement. The rover went silent in 2010 and NASA officially declared it dead last year. I think it is so cool that we are actually able to land space craft on other planets and see what they look like. It would be even more cool if we could land people there. Does anybody want to volunteer to send me up there? But robotic Mars missions slated for 2016 and 2018 were cut from the president's new budget proposal, even though NASA has spent $64 million on early designs with the European Space Agency for the two missions. 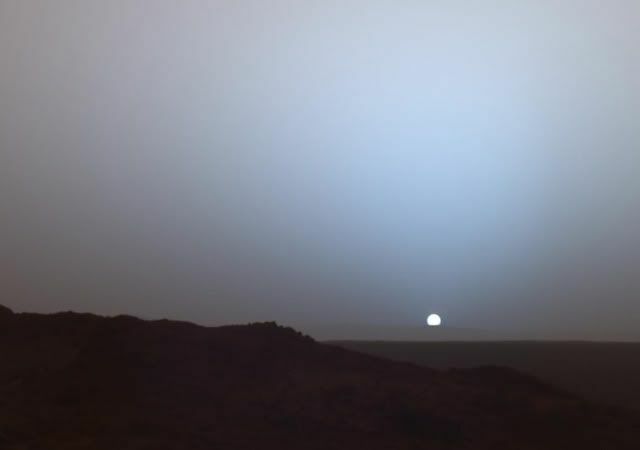 The most ambitious Mars flight yet and one the National Academy of Sciences endorsed as the No. 1 solar system priority -- a plan to grab Martian rocks and soil and bring them back to Earth -- is on indefinite hold. "We're really at a crossroads," NASA planetary sciences chief Jim Green said. NASA will skip the 2016 launch opportunity and if officials are lucky, they hope still to salvage something relatively cheap for 2018, when Mars passes closest to Earth. But it won't be the large rock-collecting mission that scientists had been counting on. What a new mission for 2018 would be is still not clear even to NASA senior officials. That's why the Planetary Society and others are lobbying to save the Mars program, starting with meetings this week. Bill Nye, the former science television personality who heads the society, said exploring Mars is central to humanity's future: "We do it to learn more about ourselves, to learn more about our relationship with the cosmos, to learn more about our place in space."